He was the first Amsterdam High School superstar athlete I can actually remember. I only got to see him play once or twice because I didn’t begin going to the games up at the Wilbur Lynch Gymnasium until the very tail end of his senior season. But I was an avid sports fan and I’d read every sports page of every newspaper I could get my hands on from the time I was six or seven years-old. One of those papers was the Recorder and I’d devour every line of the two or three pages of sports that would be included in each evening’s issue, from the “Art of Sports” columns written by my old neighbor, the great Art Hoefs, to every name and score that appeared in those nightly “Aces of the Alley” listings. I remember not being able to pronounce his last name for the longest time. “K-O-L-O-D-Z-I-E-J;” how the hell did they expect a 7-year-old kid to sound that one out? But whenever an article reporting the results of a Hilltopper basketball game appeared, my eyes immediately went to the box score and specifically, the numbers alongside that name I could not pronounce. I’d do a similar thing with the Daily News. My Dad would bring one home every night and if it were baseball season, I’d go right to the Yankee box score and check Mickey Mantle’s numbers. That’s what being a young fan was like a half century ago if your parents weren’t into sports and didn’t take you to games. You waited for the paper, you looked at the box score and you reacted to the numbers that appeared alongside your favorite players. Most of the time, the number in the column alongside Tim Kolodziej’s name would be something in the twenties. 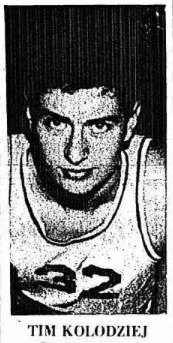 During his final year, in 1964 it got into the forties twice, (40 points versus New Rochelle and 42 points versus Johnstown) which remains even in the much faster paced game of today, a pretty spectacular achievement for any high school hoopster. But what the box score couldn’t describe for me was the tremendous all-around game this guy had. He was six feet five inches tall, fast, and strong, could jump, had great basketball instincts and was also extremely smart. Art Hoefs would use the phrase “slashing and dashing” to characterize his amazing ability to drive into and through the lane at top speed and put the ball into the hole in a variety of ways. The rest of this City was reading all those box scores along with me and hundreds were cramming into that glorious old pit of a gymnasium at the top of Brandt Place to watch this supremely gifted athlete lead some of the school’s best ever basketball teams to record-breaking win streaks and league championships. Kolodziej ended up “slashing and dashing” his way to an AHS record of 1,106 career points and a four-year-scholarship to play for Duke University. I even learned how to pronounce his last name. I’m trying to remember if his number “32” jersey and the game ball from his 42 point outburst against Johnstown are still being displayed in the trophy case up at the High School. If not, they should be. Tim was one of three children born to Ed and Sally Kolodziej, who owned and operated the old Kuk’s Grill up on James Street. After graduating from Duke, he married the former Sandy Gallagher, also from Amsterdam. They now live in New Hampshire and are spelling their last name “K-O-L-O-J-A-Y.” Even a seven-year-old box score reader could have figured out how to pronounce that. Another April 10 Amsterdam Birthday Celebrant never payed round ball but he did become famous for something else that was round. That is a great story on Tim. I babysat Sandy Gallagher as she went to St. Anns church with her parents. Her Dad owned Gallaghers Jewelers. I also remember Kuks.